The third volume in this YA fantasy series just came out. 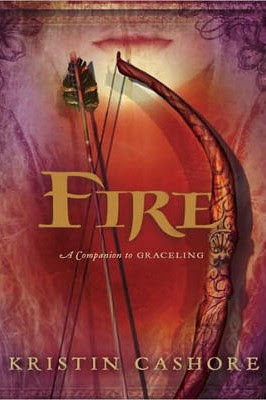 It's called Bitterblue and got good reviews, so I bought a paperback (with its beautiful cover) of the first volume, Graceling, and shortly thereafter the second volume, Fire. Both are the kind of book that you can't wait to get back to at night. I keep describing the series to people as "old-fashioned, in a good way," and then thought, "What exactly do I mean by that?" First of all, it takes place in a kingdom. There's a castle and princes and princesses and beautiful horses. Their world is not our world, but it's pretty close to our fairy-tale world. Attention has been paid to world-building, the process by which a fantasy environment is fully realized through internally consistent details of language, physics, social relations, and so on. But it hews close to the fantasy world already created by our European forebears on those cold nights in the Black Forest and bright afternoons in Provence. That similarity lets you jump right in, rather than having to situate yourself in a wholly alien universe (a process that can be fun too, but a different type of fun). Second, it has the quality of a story or tale. Partly this means it's familiar. Someone falls in love, someone goes to war, someone performs acts of bravery. Partly it means that its concerns are largely classic (bravery, endurance, self-discipline, love, honor), though it's not devoid of postmodern angles (identity, power). Partly it means that the author is just a really good storyteller. Third, it's not out to wow you with dazzling prose or a complex form. The strength of the writing comes from its efficacy within its genre. You're likely to love it for its plot and characters more than for exquisite turns of phrases or a startling formal structure. This is not a euphemistic way of saying "the writing's not that great"; the writing is great, and I appreciate that the author takes time for quiet scenes like a girl in a stable talking to her horse or two friends talking on a roof under the stars. It's not all action and heroics but it doesn't feel bogged down or slow either. I'm glad to see some novels of realism hit the YA market (like The Fault in Our Stars). But as long as talented people keep writing fantasy, I'll keep reading.